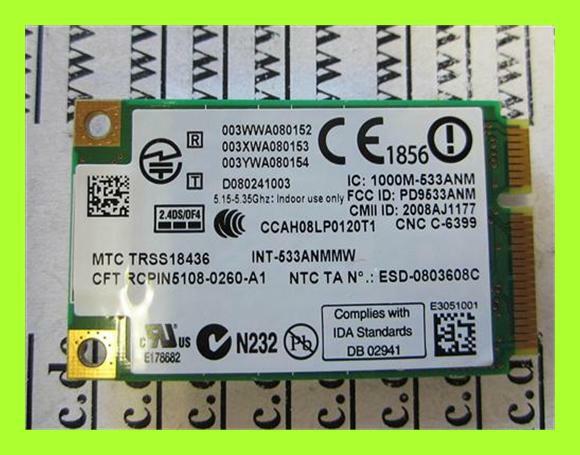 Intel® WiFi-Adapter, die dem 802.11 N-Entwurf¹ entsprechen, bieten bis zu 450 Mbit/s Bandbreite² für die anspruchsvollen Anwendungen von heute, etwa zum Streamen von HD-Videos oder Sichern von Mediendateien. Damit Sie an mehr Orten online gehen können, sind die dem 802.11 N-Entwurf¹ entsprechenden Intel Produkte abwärtskompatibel zu den älteren 802.11a/b/g-Netzen, die heute in Verwendung sind. Betriebssytem: Windows XP, Vista, Windows7, Linux. Die Treiber können Sie direkt von Intel.com unterladen. 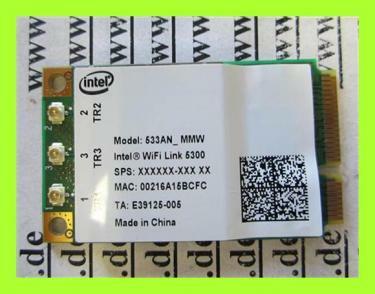 The Intel® Wireless WiFi Link 5300AGN product is an embedded 802.11a/b/g/Draft N¹ PCIe* Mini Card network adapter card that operates in both the 2.4GHz and 5.0GHz spectrum, delivering high throughput and a host of features that enhance today's mobile lifestyle. Deploying WLAN technology in your home and business increases productivity, efficiency and flexibility by enabling faster decision making, reducing down-time, and enhancing employee satisfaction. 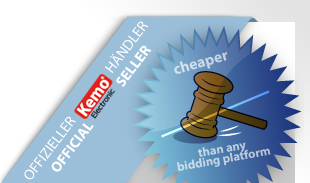 For more information visit our WLAN ROI and WLAN Deployment web pages. Intel Wireless WiFi Link 5300AGN provides deployment flexibility and connectivity convenience by offering a quad mode (supporting 802.11a/b/g/Draft-N) product, which is capable of connecting to new "Connect with Intel® Centrino® processor technology" wireless N Access Points / Routers, but can also connect to any of the legacy Wi-Fi standards, 802.11a, b or g.
Data rates up to 300Mbps offer major improvement over today's 802.11a/g products that deliver 54Mbps. This helps overcome network capacity issues, allowing increased simultaneous network activity for large file transfers, network backups, streaming video, multi-player gaming, VoIP and more. MIMO, diversity and three antennae support enable better wireless reception for greater bandwidth at farther distances. This helps reduce the number of "dead zones," dropped data packets, and network re-connects, helping to dramatically improve connectivity throughout the home and enabling more consistent coverage in the enterprise. 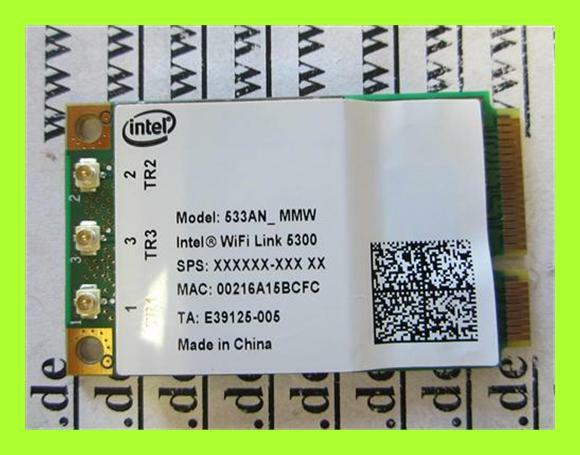 Intel® PROSet v11.1 WLAN Software Well known, feature-rich application provides continued support for legacy and next generation Draft-N features on Microsoft Windows 2000*, Microsoft Windows XP* and Microsoft Windows Vista* via an 'easy to use' interface. This optionally installed toolkit enables network managers to create and distribute WLAN connection profiles, centrally set driver and application settings, distribute driver and software updates and package custom settings into a self-installing executable file. These tools help simplify deploying or updating wireless settings and profiles on notebooks remotely. Allows for increased wireless security by providing the WPA2 AES based algorithm. AES is the strongest encryption algorithm available today for mobile clients and helps ensure that enterprise wireless networks are protected with stronger authentication and encryption security. Allow IT managers to remotely discover, heal and protect wireless notebooks. Features include enhanced asset management, remote system diagnostics, network protection and security independent of the operating system functional state, resulting in reduced on-site support costs. Intel has certified Access Points from leading vendors through extensive compatibility testing allowing users to connect with confidence. This identifier can be found on Draft-N wireless access points to ensure compatibility and real-world performance with laptops based on Intel® Centrino® processor technology. A collaboration between Intel and Cisco that provides integrated wireless LAN solutions including Enhanced VoIP Quality Technology and Optimal AP Selection Technology. Intel is the lead collaborator with Cisco on Cisco Compatible Extensions. Key features in Version 4 include: Cisco Centralized Key Management, Call Admission Control, Unscheduled Automatic Power Save Delivery (U-APSD) and Voice Metrics. Resulting improvements include, helping to prevent noticeable delays in VoIP calls when roaming between Access Points, and improved network diagnostics. Supports current Draft-N standard direction to support 40MHz channels only in 5GHz spectrum to minimize negative impact to legacy devices/networks nearby. Prüfen Sie bitte vor dem Kauf die Kompalität der WLAN Karte zu Ihrem PC!